The sad reality of any celebrity passing is that we have to ask how their death will impact any ongoing work in the future. In the case of Carrie Fisher, that means the continuing Star Wars saga, Episodes VIII and IX. Multiple sources are confirming that Fisher’s work on Star Wars: Episode VIII, scheduled for release in December 2017, was complete. However, how her death will affect the subsequent films is still up in the air. Rumor has it, she was scheduled to appear in 2019's Episode IX, but that’s difficult to verify until the eighth film is released. Fisher reprised the role that made her a global superstar for last year’s Star Wars: The Force Awakens. The film revealed that after Return of the Jedi, Leia continued to fight against the Empire, which was then replaced by a smaller, even more sinister group called the First Order. Now a General, Leia led a small Resistance against the First Order against the advice of the Senate. As the film ended, she lost Han Solo, the father of her son, but had renewed hope in the future as the young hero Rey went off to find her brother, Luke Skywalker. In Episode VIII, directed by Rian Johnson, we’ll see how Leia’s journey continues. 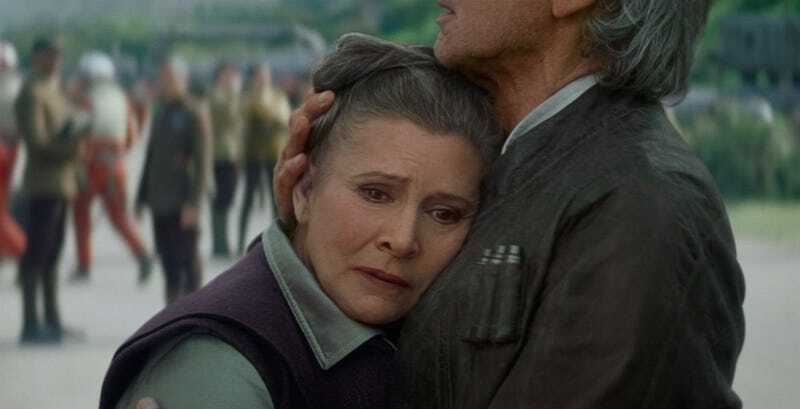 There’s no doubt she’s going to be an important part of the film—but how Fisher’s death will ultimately impact the saga remains a sad, inevitable mystery.